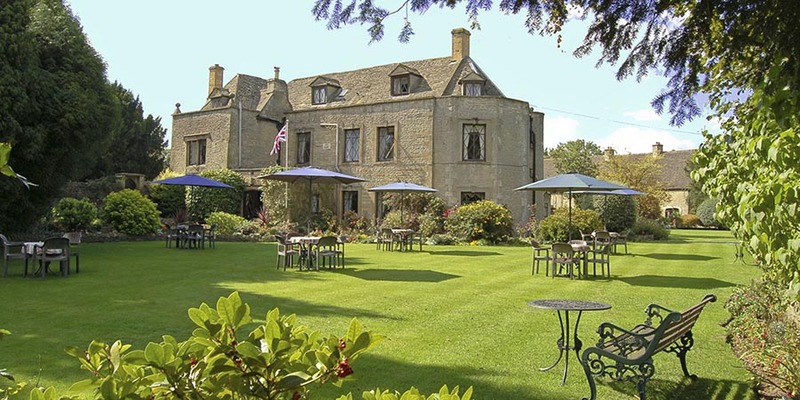 ﻿ Hotels in the Cotswolds - Welcome to Stow Lodge Hotel - History. In the 1700’s Dorothy Hippisley of Lamborn in Berkshire married Edward Morris, the Rector of Stow-on-the-Wold. Upon the Rectors death and having no children she bequeathed the advowson of the Church to her first cousin Richard Hippisley of Lamborn in Berkshire. In 1744 Richard Hippisley became the Rector of Stow. The Rectory in Sheep Street was not large and in 1763 he built a new Rectory alongside the churchyard, which is now Stow Lodge Hotel. Following his death in 1765 Richard was succeeded by his eldest son, the Rev. John Hippisley. John had inherited the family estate in Lamborn but decided to stay in Stow. John married Margaret Cox and they had six children together. Upon his death in 1822 the advowson passed to his son the Rev. Henry Hippisley. Henry inherited the family estate in Berkshire. He settled there with his wife Anne Rollinson and they had eleven children together. Being no young Hippisley available to succeed John his curate Richard Vavasour became the Rector of Stow. Henry Hippisley permitted Rev. Vavasour to occupy Stow Lodge until his son Robert William Hippisley required it in 1839. Before residing Robert spent a considerable sum of money on repairing and making alterations to the house and also adding to the buildings. A Mr. & Mrs. Paynton acted as caretakers at Stow Lodge during this time until Robert, newly married to Grace Louisa Raikes, took up residence in 1841. Dent de Lion School - Room 2 as Dormatory. Robert also spent a large sum of his own money repairing St. Edwards Church which had come under dis-repair during his grandfather, John Hippisley, time as rector. In late 185o’s Robert built a magnificent house on Stow Hill known as Quar Wood. He lived there with his wife and six children until 1877. During this period Stow Lodge was let to tenants. A Thomas Rolt and his wife Annie were tenants from about 1865 until 1874. They had six of their twelve children together whilst living at Stow Lodge. Rev. Robert Hippisley returned to Stow Lodge in 1877 and stayed there until resigning in 1898. He was now well in his eighties and moved to Beechwood, Lower Swell to live with his spinster daughter, Gertrude. 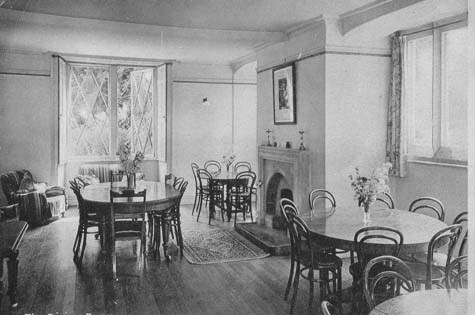 Dent de Lion School - The Bar was the School Dining Room. During his time as Rector he had many bitter disputes with the town’s people, quarrelling about many of the town and church affairs. He was so unpopular with the towns people that on 5th. November, 1898 they paraded his effigy around the town and burnt it. In 1900 Henry Ingles Chamberlayne rented Stow Lodge from the Hippisleys. 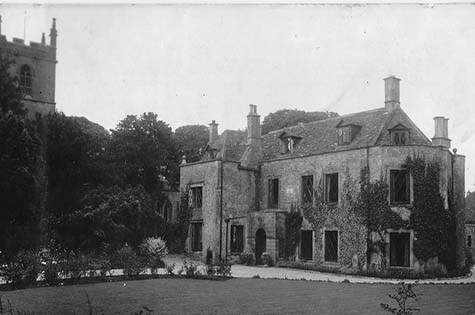 He resided at Stow Lodge for short period in-between selling Maugersbury Manor and the building of his new residence Hyde House in 1901, now Fosse Manor. Mark Hookham a builder bought Stow Lodge in 1900 from Robert William Hippisley with the Chamberlaynes still residing as tenants for a short period. Upon Mark Hookhams death his representatives sold Stow Lodge to Rev. Robert Hippisleys great nephew, Henry Hargreaves Sulivan Hippisley in 1934. 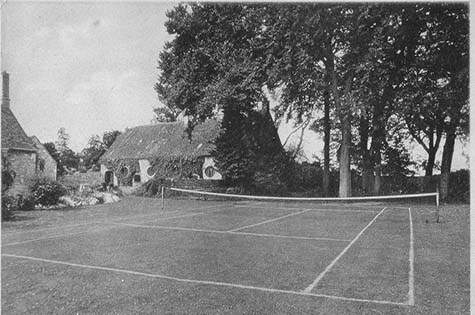 Dent de Lion School - Side Gardens as a Tennis Court. 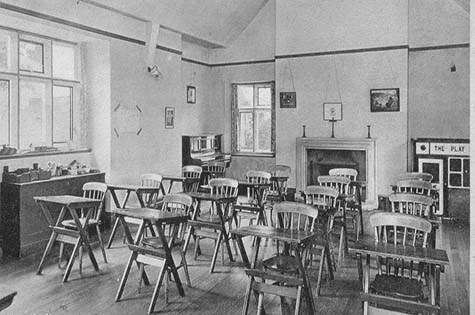 In the late 1930s a school from Kent rented it for the war years taking in boarders as well as day pupils. The Dent de Lion School, whose motto was ‘Be thorough’ was run by two sisters, the Miss Chillcotts’. They were known as Aunt Dorothy and Aunt Norah and were helped by Matron, Miss. Dorothy Edgar and maid of all work Mabel. The top floor of the house was the kindergarten with the room next door being the Head Girls bedroom (Now Room 16). 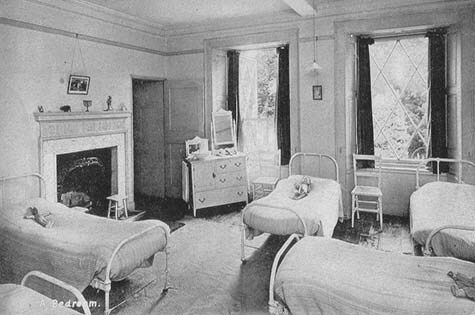 On the first floor was Matron’s bedroom (Room 1) with the pink dormitory next door. The two other dormitories on this floor were known as blue and green. On the ground floor behind the bookcase in the lounge was the headmistress’s study, where piano lessons were held. There was also a staircase to matron’s bedroom. Across the hallway, where the bar is, was the school dining room. 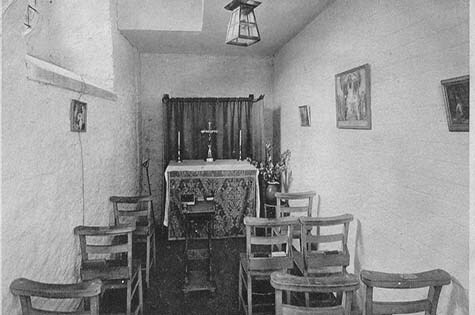 Dent de Lion School - Chapel in the Hotel Coach House. Along the hallway to the present restaurant was the former schoolroom. It had a small stove as the only form of heating and pupils remember heating pennies on the stove to melt the ice on the windows. Across in the coach house was the schools chapel. The present day car park was a well-stocked kitchen garden. Dent de Lion School - Restaurant was a Classroom. Mr. and Mrs. Jux, the present owner’s parents came to Stow Lodge in 1954 purchasing it from the representatives of Henry Hargreaves Sulivan Hippisley. Stow Lodge Hotel is run today by Mr. & Mrs. Jux’s daughter Valerie and her husband David Hartley together with their two sons Chris and Steve. Their wives Amanda and Nicky are also involved. Chris and Amanda’s daughter Charlotte (Lottie) has just started working full-time in the business with her younger sister Isobel helping out on occasions. Steve and Nicky’s two sons, Arlen and Lucas, are too young at present to be involved but will be a welcome addition in the future. One of the final decisive battles in the English Civil War took place near Stow. To read more about this Historic event.